The unit pumps air, non-aggressive gases, vapors and air-steam mixtures out of the transformers and hermetical vacuum systems. 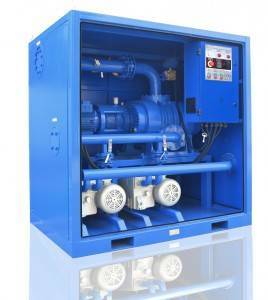 Vacuum unit consist of rotary vane type vacuum fore-pump(s) and booster of Roots type. Control cabinet keeps electrical devices for plant operation. The cabinet mentioned is a metal box with lockable door. The cabinet’s inner panel keeps electrical switch devices. Operational and control buttons as well as light alarm are placed on the cabinet. Vacuum pipeline is a welded construction of pipes, check valve, pressure gauge, disk shutter and air ingress tap pipes. Ground is a welded construction for unit aggregates mounting. Container is a welded construction containing inside all component parts. The manufacturer reserves the right to improve functionality of the unit. Thus, some aggregates and components can be amended without impairing unit technical specifications.